Ngauman Jersi Terbaru Skuad Kebangsaan! 6 Perkara Paling Berbaloi Jika Ke Karnival 2018 Astro Karangkraf! 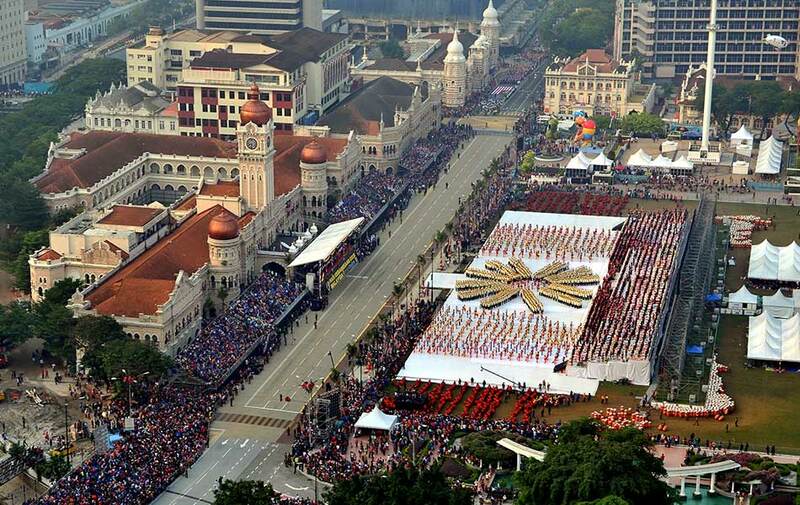 Dataran Merdeka has always been a significant venue here in our beloved country, Malaysia. Before its name change in 1989, it was known as Padang Kelab Selangor. It holds such precious memories. There are countless stories to be told about what had taken place here. Well, what happened here on the midnight of 31 August 1957 is certainly worth reminiscing. 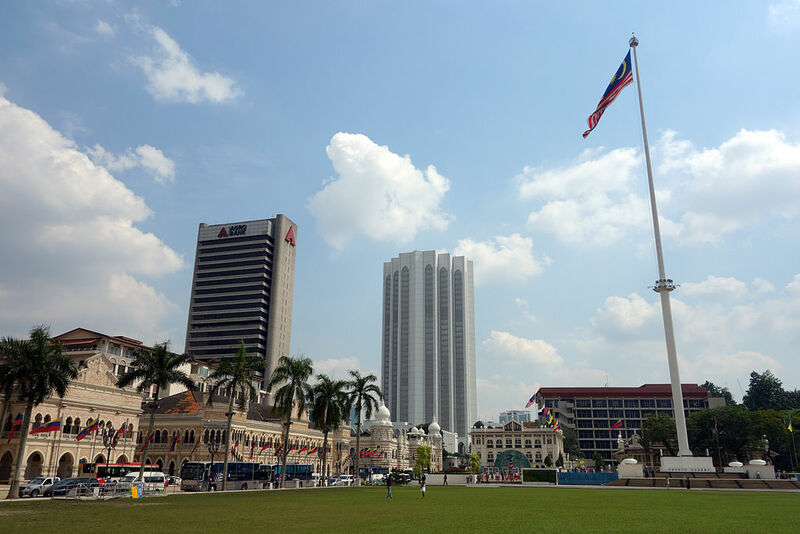 It was then at this picturesque location that the Union Flag was lowered and for the first time, the Malayan flag was raised. The national anthem, "Negaraku", was also played as this went on. It truly was a historical moment that continues to stay fresh and treasured in the minds of many. Fast forward to 1963, with the merging of Sabah, Sarawak, and Singapore with Malaya, Malaysia was formed. In conjunction with that, the Malayan flag was modified. Three more stripes were added and the star was designed with 14 points. Even after Singapore was no longer part of Malaysia, the design of the flag stayed. Every bit of the flag’s design carries a deep meaning behind it. 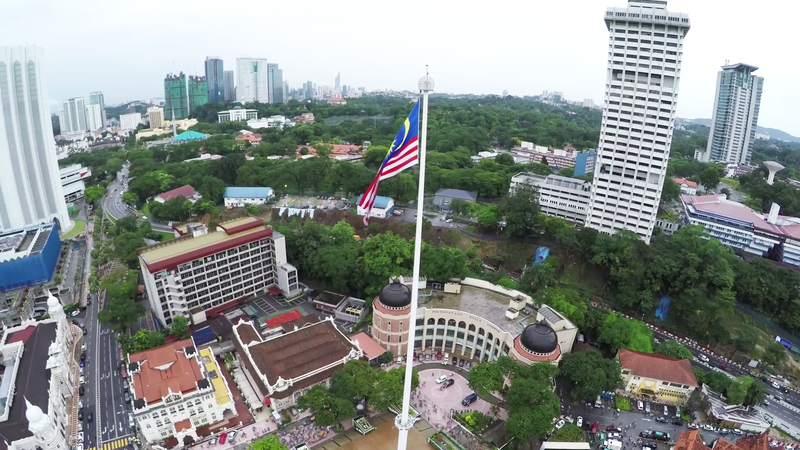 Today, the Jalur Gemilang continues to fly high and proud at Dataran Merdeka. It is fair to say that it is among the major highlights here. Why wouldn’t it be? 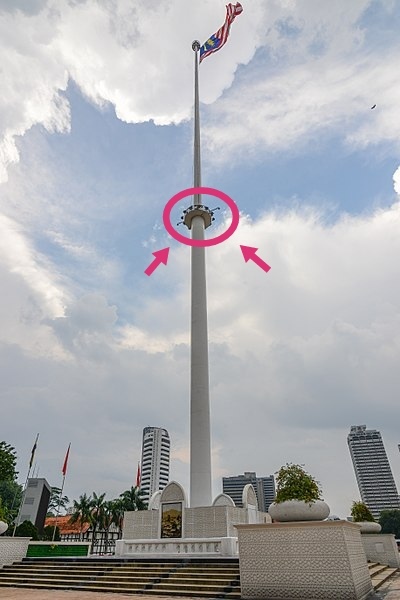 At 100 meters in height, the flagpole itself is one of the tallest there is in the whole wide world! Just for the record, there was a point in time when it was THE tallest flagpole in the world. 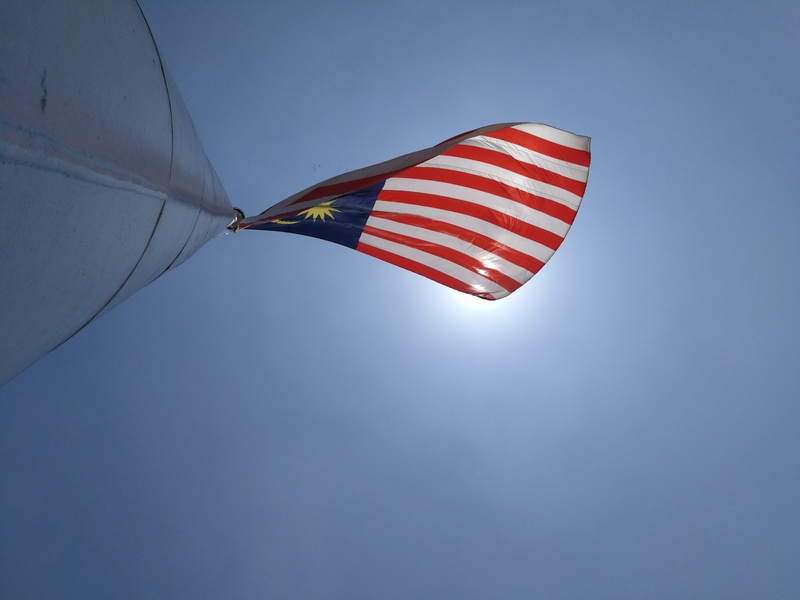 And it is only fitting that such a flagpole is complemented with an incredibly huge and gorgeous Jalur Gemilang too! It absolutely is a glorious sight. And for that, we’d have to thank the men behind the scenes who continue to make it possible. It is a task that requires great effort but someone has to do it! For that, Dewan Bandaraya Kuala Lumpur works hand-in-hand with the contractors they appoint. We spoke to the guys and even tagged along with them to see how they work! 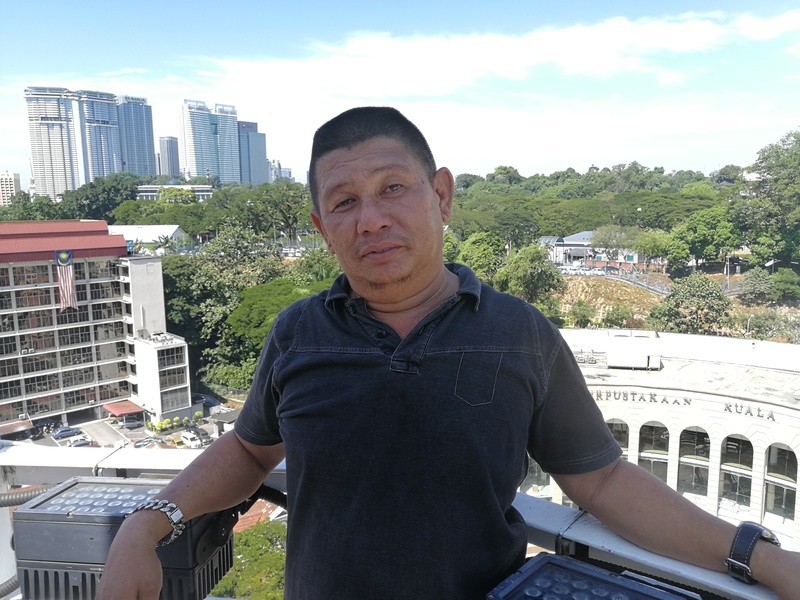 Osman Jalani Hamid, an assistant engineer who has been working with Dewan Bandaraya Kuala Lumpur for 36 years now. 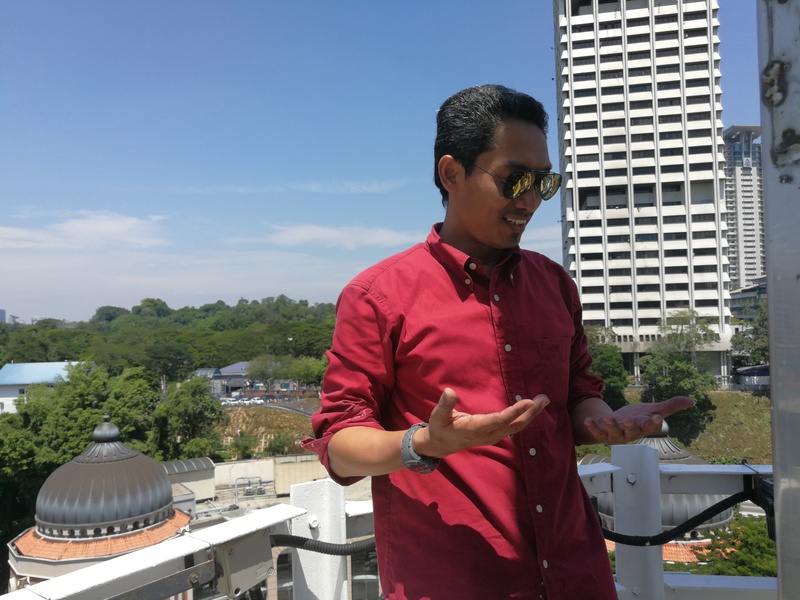 Ahmad Shahril Shafie, or better known as Shah, the Operations Manager. 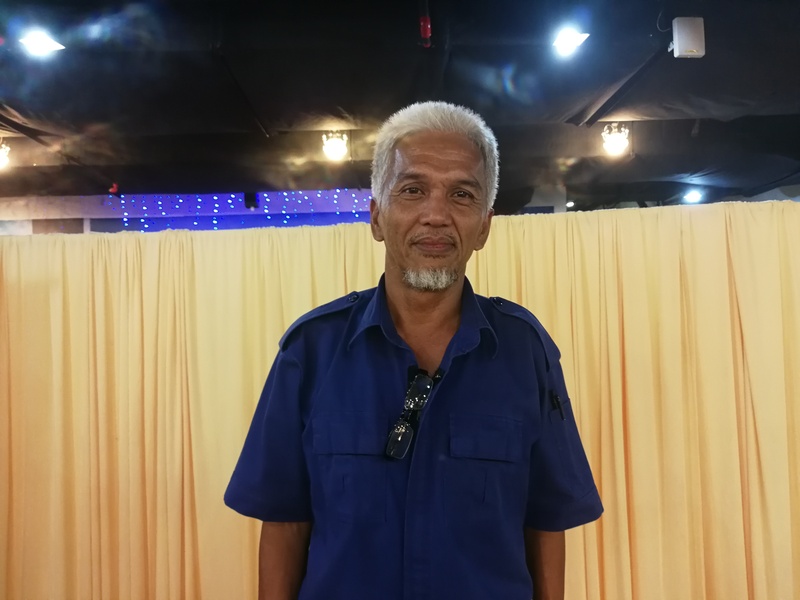 Zhairul Anuar, who is the Supervisor for the team responsible for taking care of the Jalur Gemilang. 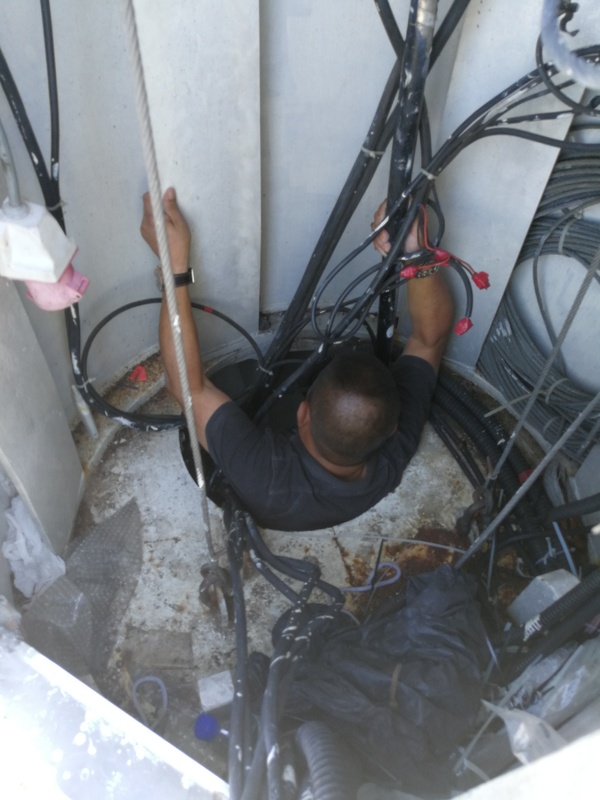 Hasbullah Abdullah, an important member in the team who gets the job done. And last but not least, Muhammad Amirul Safuan, who also gets the job done! Just to get to the platform where the changing and hoisting of the flag is done is not as easy as we thought it would be. The platform itself is 40 meters high. This is also where the spotlights are! If you thought that there is the convenience of being transported up by a lift or anything of that sort, well, you are mistaken! 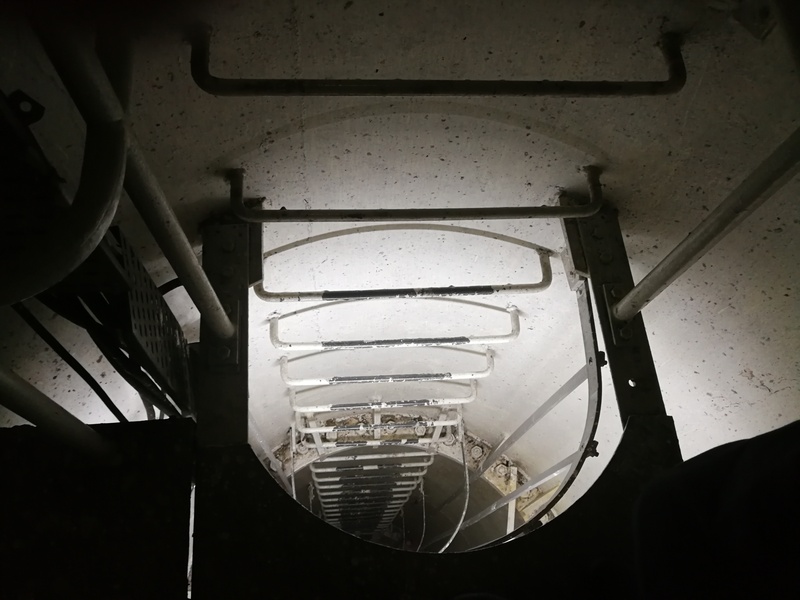 One would actually have to climb up a series of built-in ladder steps – or vertical monkey bars as we call it – with his/her bare hands through a narrow upright tunnel! It is no joke, folks! We did the math and the height covered could be a standard building’s 12th floor! While we struggled our way through, these guys climbed up so effortlessly. Climbing up such height is tiring. We even asked for a timeout to catch our breath. These guys stayed as cool as a cucumber though. It clearly shows how experienced they are. Speaking of experience, Zhairul told us that it does take some training before one is absorbed into the team. “They would have to learn how to assemble the parts. In fact, they would have to learn a lot of things – even how to take the flag out from the box because it matters which side you pull from to ensure that it spreads out in order”. As if the whole climbing activity isn’t good exercise already, these guys would also have to carry with them the huge twinkle satin Jalur Gemilang. According to Zhairul: “For each session, we’d have at least three men to go up”. The two would have to carry the flag – one pushing and one pulling – while the third man would be of extra help later in the process. Nothing makes the dream work like the teamwork! Shah also pointed out that when they are up there, everyone is equal – they are to work together no matter the post they hold. Once the personnel is safely up there with their gears, it would be time to bring down and replace the older flag with the new one. 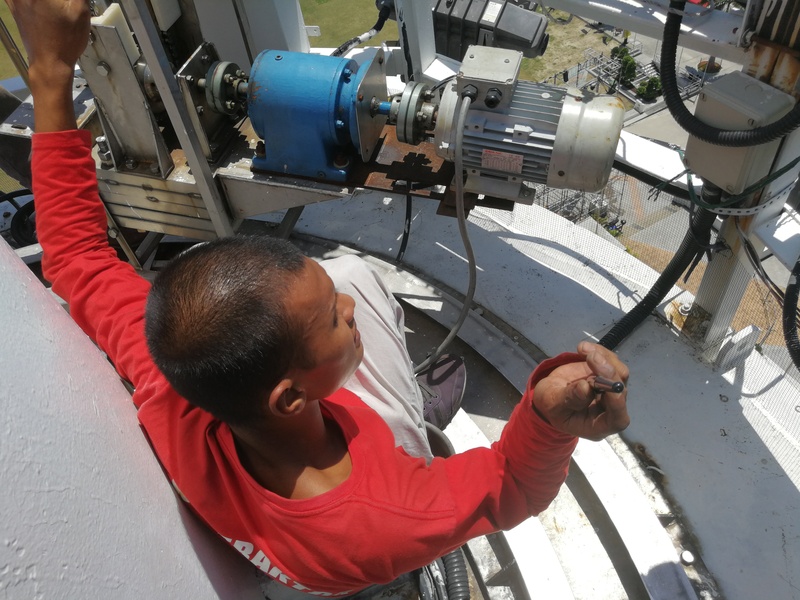 To do so, Shah said that they would have to detach it from the roller chain which acts as the main cable. It certainly is not as simple as it sounds! Remember – it is a HUGE flag! Once it has been detached, the flag has to be folded and kept away from the public’s eye – this is a compulsory step. 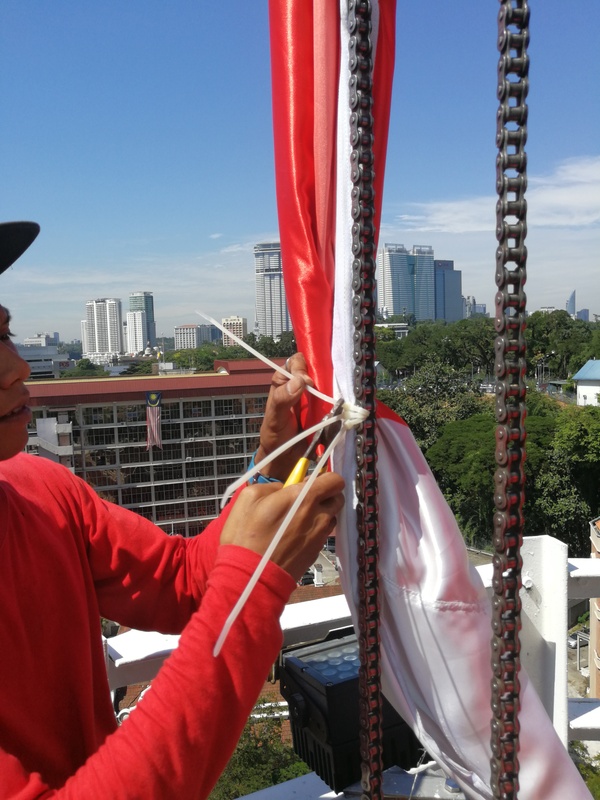 To hoist the new flag, they would first have to attach it to the roller chain by tying it with heavy-duty cable ties and some strings too. Then, it would be time to raise it to the highest end of the pole it could go. This part takes massive skills and strength! It involves pushing and pulling a heavyweight roller chain and dealing with the elements of nature. The motion executed when raising the flag here doubles as your arm workout! It just cannot be compared to that flag-hoisting ceremony in school that the prefects are in charge of. The key players in this process are Hasbullah and Amirul. It gets technical as they have to work the flag according to the situation. “The weather could make or break the entire mission. It’s something that we can’t control. 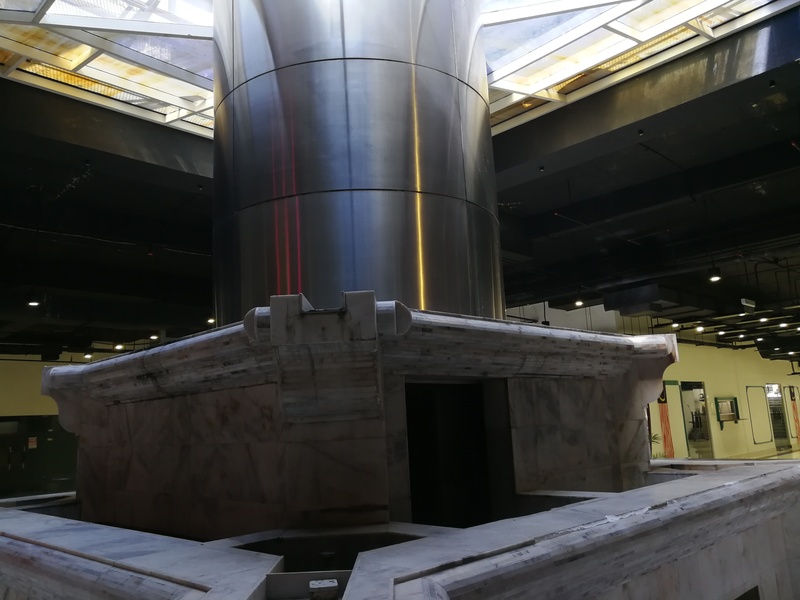 So, we just have to go with the flow,” said Hasbullah. They cannot simply hoist the flag as they please, he told us. On a windy day, the flag gets worked into many shapes and it is moved to various positions on the platform to suit the direction of the wind before it is raised. There is a track incorporated to help make moving it around easier. They prefer the manual way of getting things done even though they do have the winch machine that could do it for them. “If we let the motor of the machine run on its own, it will just keep going – no matter the circumstance. At times, that could lead to a torn flag and that would just defeat the whole purpose,” Shah elaborated. On a day without wind, the whole process could take a couple hours but when it is windy, it could stretch to as long as the whole day or even longer! 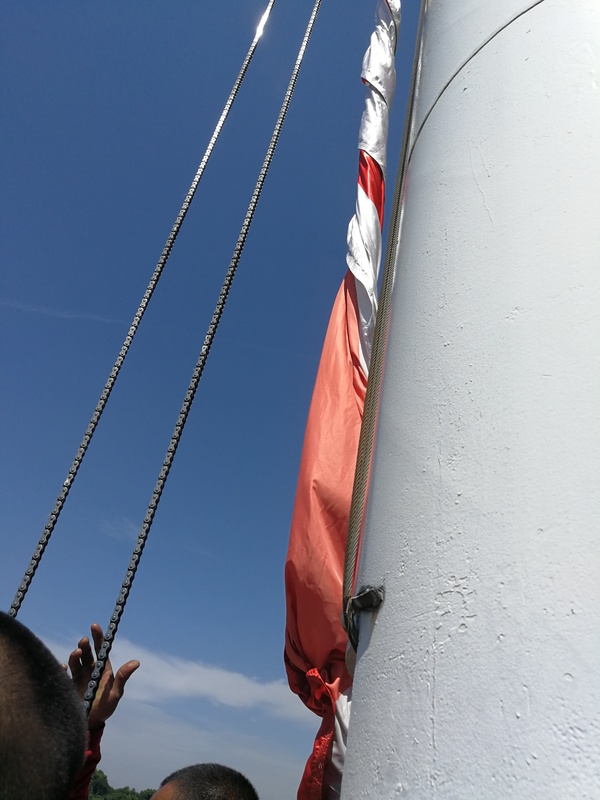 Now that we're done changing the Jalur Gemilang, we had to go down the same way we went up. Yes, that means a 40-metre climbing down session, ladies and gentlemen! They would have to carry the old flag down with them too. Here’s another thing they need to keep in mind: a dry Jalur Gemilang weighs 60kg. If it happens to be wet from the heavy rain that poured, well, it would be a lot heavier. Needless to say, it could get pretty intense. Challenging, But That's What They Like! They are always on the alert especially considering the great risk that comes with what they do. 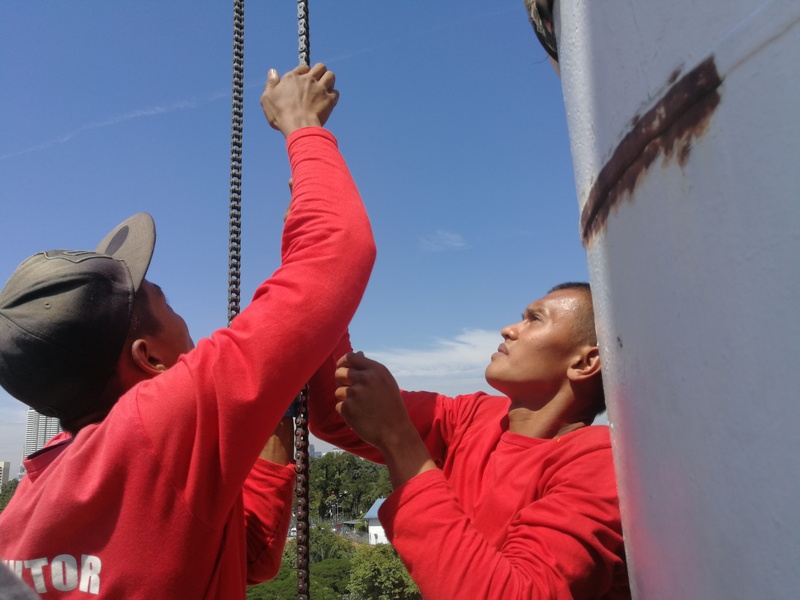 Handling the roller chain with their bare hands, Amirul had experienced a deep cut across his palm from when they had to hold onto it because it wasn’t the right time to hoist the flag. There was also an incident whereby one of them was briefly lifted off the platform as he was holding onto the roller chain. The wind could get THAT strong and even more! Related knowledge, experience, and skills are crucial. By just standing up there when the wind is blowing, one could feel slightly wobbled by it. We can vouch for this because we felt it too! We were kept on our toes the whole time we were up there! It was really cool though. The schedule states that the Jalur Gemilang has to be changed to a new one every once a month. 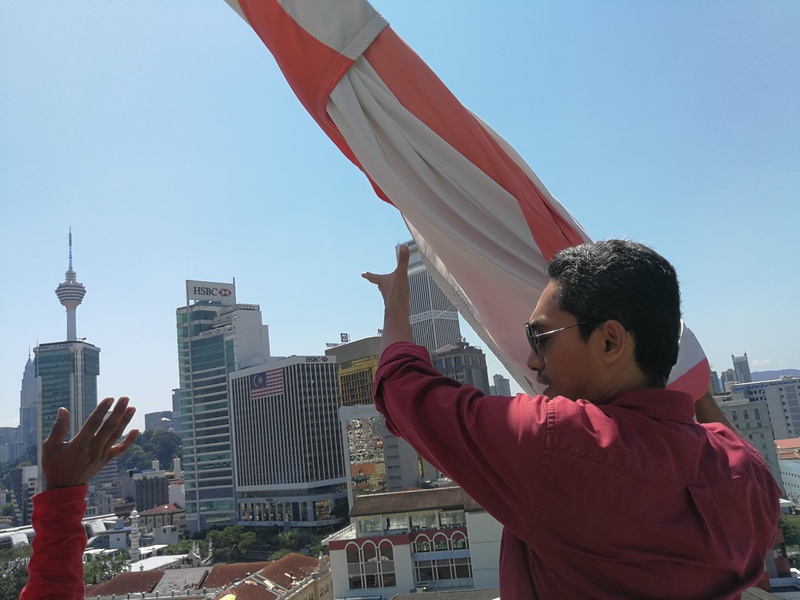 Shah explained: “Once we get the instructions from Dewan Bandaraya Kuala Lumpur, we will have to bring up a new flag." However, he added that if anything happens to the flag before the next scheduled date, the team will have to attend to it straight away to do what is necessary. In other words, even if they had just climbed up, changed and hoisted a new flag a day ago but that flag somehow got torn (lightning could do this) or washed out, they would have to attend to it immediately and carry out the same process all over again. Therefore, they do have more of such Jalur Gemilang in their possession that acts as spares in case of any such incidents. Also, they are always on round-the-clock standby. It is nothing new nor is it a big deal to them to be climbing up and down more than once in a day to manage the flag. All is not harsh and tough though. The job does come with its perks. These men’s ‘office’ comes with such a spectacular view which not just anyone could have access to. All of them also acknowledged that the sense of accomplishment from having successfully hoisted the majestic Jalur Gemilang is so satisfying. “When I go down and see that the flag is flying up there, all the tiredness and pain just disappears. I feel proud,” Hasbullah said. Zhairul feels the same way. “After a hard day’s work, when I drive past the flag and see how it flies from inside my car, I just feel so much pride knowing that I had a share of making that happen,” he beamed. 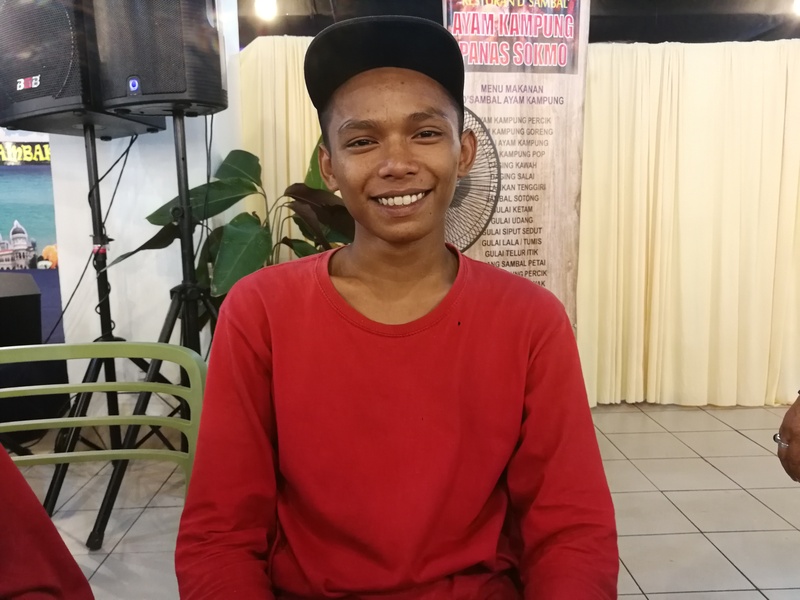 Being the youngsters that they are, it came as a surprise to many of Hasbullah and Amirul’s family and friends when learning about what they do. “They thought we were messing with them and that we were only in charge of the normal flagpoles,” said Hasbullah. “They didn’t believe us,” added Amirul. "Of course, it was a pictures-or-it-didn’t-happen case. "We had to show them the pictures. 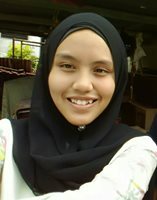 Only then did they believe us,” Amirul noted. 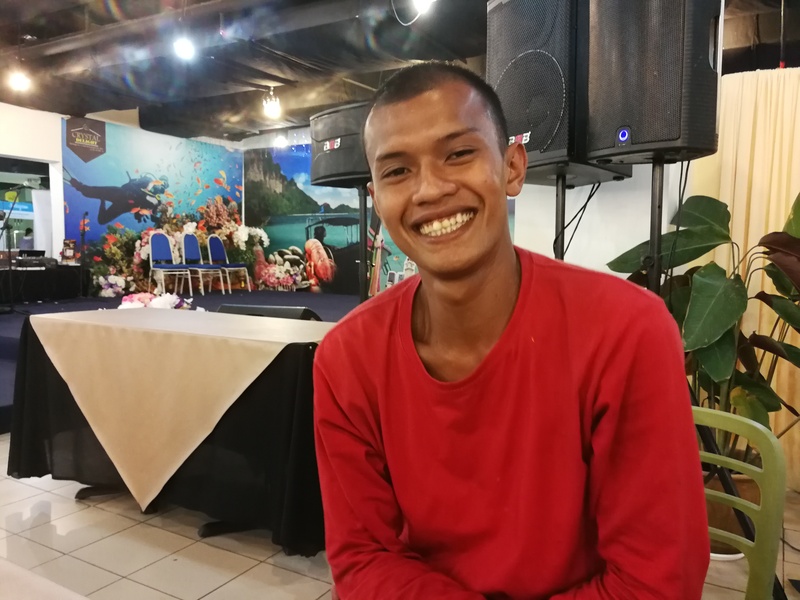 Speaking on why they are willing to endure such hard work, Hasbullah stated: “We are proud to be given the trust to take care of the Jalur Gemilang here at Dataran Merdeka. It’s not easy but it is special. “And it’s something we learnt since we were kids – we know that we have to work." On the profound memories they have had throughout the years of doing this, there are plenty. 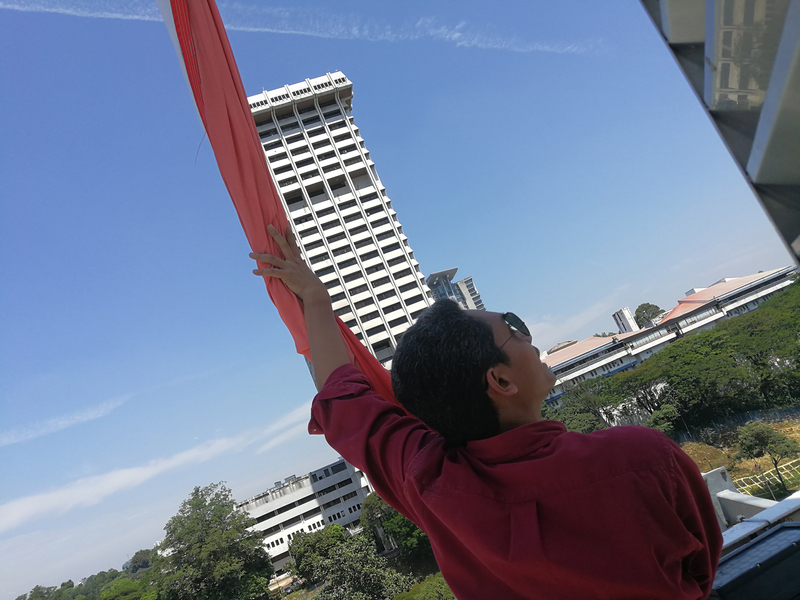 Osman said: “It is when the people on the ground starts singing the 'Negaraku' as we raise the flag. It is very touching." They take their job very seriously. Having to come by at odd hours to fix any issue that arises in relation to the flag is a common occurrence. Hasbullah shares the same sentiment. 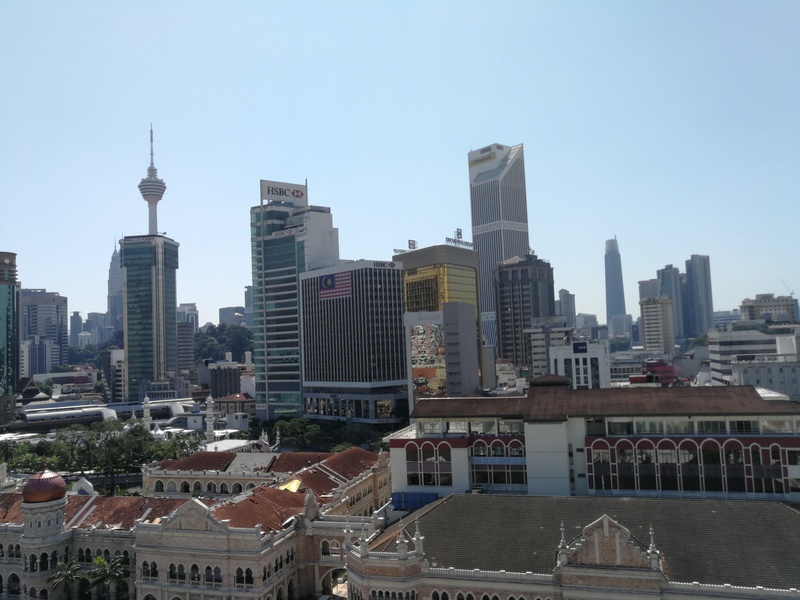 All of them made it clear that they have a strong connection with the Jalur Gemilang, especially since they had been in charge of maintaining one. It further deepens their love for the country. Having gone through almost half a day with them, witnessing how they do their work and talking to them about it, we could see how passionate they are about what they do. With that, let us all take heed of the importance of taking care of the Jalur Gemilang. 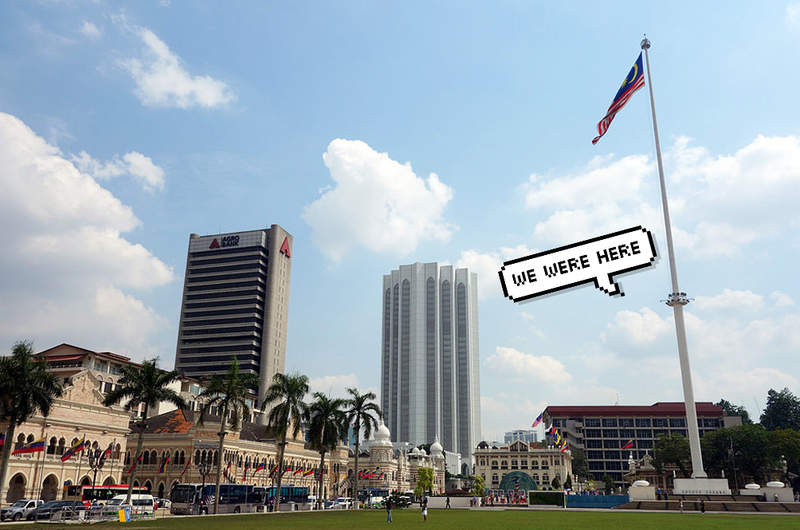 And whenever you happen to be at Dataran Merdeka, go ahead and take some time to appreciate the beauty of the Jalur Gemilang there. It was not a walk in the park to get it up there! Special thanks to: Dewan Bandaraya Kuala Lumpur, their Project Implementation & Building Maintenance Department’s officer, Khairul Amru Md. Allwi, and Rayme Zainal Abidin for making this article possible. Did You Know That There’s Now A Varsity Course For eSports In Malaysia?